The ConvertKit Integration addon allows you to subscribe quiz and survey takers to your forms, courses, and tags in ConvertKit. Once you have purchased the addon, you will have access to download the addon. To install, simply upload the addon as a normal WordPress plugin. To do so, go to the Plugins page and click Add New. Then, click Upload. From there, upload the zip file that you downloaded when downloading the addon. Once the addon has uploaded, you should now have the plugin QSM Convertkit Integration listed in your list of plugins. Activate that plugin. Once activated, the plugin will add a new tab labeled ConvertKit Integration on your Addon Settings page. First, if you want this quiz or survey to be integrated with ConvertKit, then set the "Enable ConvertKit integration for this quiz" to "Yes". Next, you can allow the user to choose to subscribe by checking a checkbox or you can have the user automatically subscribed. 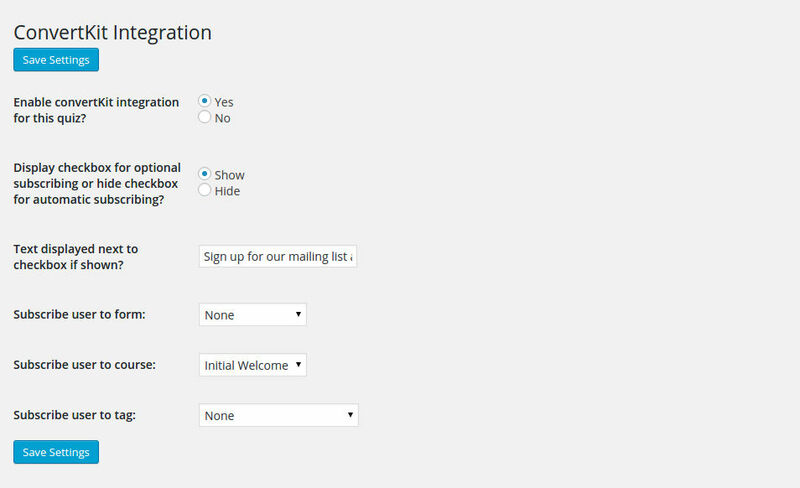 To allow the user to choose, set the "Display checkbox for optional subscribing or hide checkbox for automatic subscribing" option to "Show" and then fill in the "Text displayed next to checkbox if shown". If you want the user to be automatically subscribed, simply set the previous option to "Hide". Now, you can choose what the user will be subscribed to. You can choose from your forms, courses, and tags. Then, click 'Save Settings'. Your quiz and survey takers will now be able to subscribe to your courses, tags, and forms in ConvertKit!